We know you're worth $76 billion, but CLICK HERE TO MAKE MONEY BY WORKING FROM HOME! In March 1989, British scientist Tim Berners-Lee published a paper proposing an "information management" system for his laboratory. His supervisor, Mike Sendall, scrawled some brief comments on the cover: "Vague, but exciting." Sendall couldn't have been more right. Berners-Lee's proposal, conceived to improve information sharing between universities and researchers around the world, paved the way for the World Wide Web as we know it today. Countless pundits have followed Sendall in the years since, prognosticating about how the Web will and won't transform society. Not all of them were accurate... and some really missed the mark. Here are five that were dead wrong. Speaking at the World Economic Forum in Davos, Switzerland, the Microsoft (MSFT) founder said spam would be gone within two years. Email filters and "human challenges" -- forcing the sender to solve a puzzle, for example -- could help cut down on unwanted emails, Gates said. He also predicted a "payment at risk" system in which email senders were forced to pay fines when their messages were rejected. 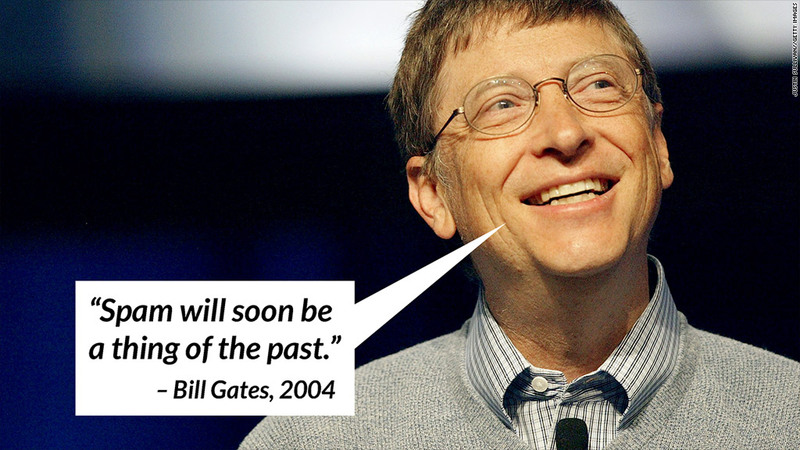 "Microsoft is pursuing all three approaches, and spam will soon be a thing of the past," Gates said. The reality: Filters have helped. But 10 years later, Internet users still are getting deluged with emails for Cialis and mortgage refinancing programs. As of December, spam still constituted 68% of inbound email, according to Greenview Data. Fifteen years before plunging ad revenues forced its owners to sell Newsweek for $1, the magazine published an anti-Web screed from cybersecurity expert, astronomer and author Clifford Stoll. He called the Web "a wasteland of unfiltered data", and complained that reliable voices were being drowned out by the rabble. "The truth is no online database will replace your daily newspaper," he wrote. "Nicholas Negroponte, director of the MIT Media Lab, predicts that we'll soon buy books and newspapers straight over the Internet," Stoll added. "Uh, sure." The reality: You know how this one turned out. You're reading this online, right? Robert Metcalfe is no techno-phobe -- he's actually a highly regarded engineer who was one of the inventors of Ethernet networking technology. But Metcalfe worried that mass adoption of the Web would overload it. As more and more people connected, Metcalfe said the Internet would "go spectacularly supernova and in 1996 catastrophically collapse." The reality: It may seem like the Internet has exploded when Gmail, Facebook or Twitter has a service outage for a whopping half hour. But as we said earlier, you're reading this online, right? Infographic: What is the Deep Web? Lawyer and researcher Peter Huber was a digital optimist. The increasing ease of communication in the Internet era, he predicted, would make it impossible for governments or corporations to control the flow of information. "Orwell's world, the world of computer and communications monopolies, will not be seen again in our lifetime," Huber wrote. "The loose ends and the forgotten comers have taken over." The reality: Anyone who's been reading the news this past year knows how far off this one was. Tech giants like Google (GOOG) and Facebook (FB) have vast troves of data on their users, and former National Security Agency contractor Edward Snowden has revealed government spying programs that can track people around the world wherever they go online. We return to Stoll for this last one. He managed to get a staggering amount wrong in just a few hundred words. He also scoffed at the idea of "virtual communities", doubted the Web could have practical applications for government, and wondered how anyone could get any research done in the maze of online information. But with regards to retail, he thought the lack of human contact would doom the Web as a sales medium. The evidence? His local mall "does more business in an afternoon than the entire Internet handles in a month." "Even if there were a trustworthy way to send money over the Internet—which there isn't—the network is missing a most essential ingredient of capitalism: salespeople," he wrote. The reality: In a word, Amazon (AMZN). In another word, Borders.